4.0 out of 5 based on 230 bloggers and 29 commenters. NewsMagazine is a free blogger template adapted from WordPress with 3 columns, left and right sidebars, footer columns, slider, social bookmarking icons, posts thumbnails, tabs, drop down menu and neutral colors. Excellent template for blogs about any general topic, business or news. Trying this for my sports blog and its definitely attractive thanks. good temaplate. May download this tema. I will try this tema in my blog. Nice to meet you Brother. Hi, I want to know do i edit the flash images to what I want ? What should the size of the image for the slider be ? How can I increase the width of this template? I love this one but I want it to be 1280px in width. Or at least 1200px. How can I increase the width without messing up with the gadgets? Can someone guide me through this. Would be grateful. Thanks! Keren banget desainnya. Ijin unduh ya. I’m having a hard time locating the social profiles section to input my links. Looks great. With some modifications, this could well be a premium template. Looks great. With some modifications, this could well be a premium template. Include pleasant color combinations in the background, some more CSS magic and voila! It will work for all types of blogs. Very nice template. I will try it. 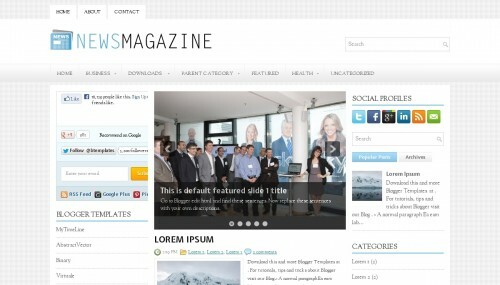 This is an awesome theme for magazine of info blogs. I really appreciate the appearance of this template and would use this on one of my blog. I really would use this theme on my blog and try to moderate and make it suitable as to my needs and will promote as a post as well. it’s good template, i like this! awesome theme. I am hooked to it. Really great template for Blogger. Appreciate it, thanks for putting it up here. With some customization, it’s going to rock.